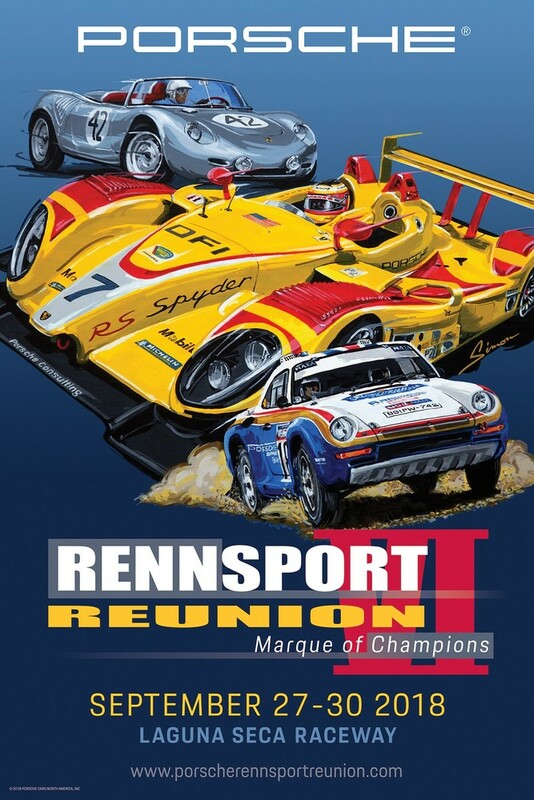 Dennis Simon has knocked his assignment out of the proverbial park, yet again, with the new poster for this year's upcoming Rennsport Reunion VI celebrations. Having created four of the previous five posters for Porsche's premier vintage racing festival, he clearly has mastered the aesthetic that Porsche enjoys for their look. With classic brush-stroke painted graphics, this is reminiscent of Porsche's motorsport-inspired dealership posters of the good old days. This year's Rennsport Reunion poster features prominently the Penske Porsche RS Spyder LMP2 racer of the late 2000s, front and center. This DHL-sponsored car fought well above it's class, taking on the might of the Audi diesel LMP1 prototypes at tracks all over the North American continent. It won a number of races overall, and won the American Le Mans championship laurels in 2008. In the upper left corner, you can see the gorgeous shape of Porsche's first endurance racer to take an overall victory. This 718 RS 60 brought Porsche to the world stage in endurance racing, having won the 1960 12 hours of Sebring outright. Hans Herrmann, and Olivier Gendebien teamed up to complete a mega 196 laps, ahead of an identical car entered by Brumos. The pair of 1.6-liter sportscars finished 1-2 ahead of a scad of larger displacement Ferrari 250s. Jumping out of a cloud of dust and sand in the lower right corner is Porsche's strangest and perhaps most incredible victory ever. The 1986-winning Paris-Dakar rally Porsche 959 Group B is resplendent in perhaps the best looking of Porsche's Rothmans liveried cars. Having covered 6200 miles to beat the best rally cars in the world, this car has rightfully earned its place in Porsche's motorsport history. I don't know about you, but seeing this poster finally revealed is getting me pretty excited for Rennsport Reunion VI this fall. See you there?